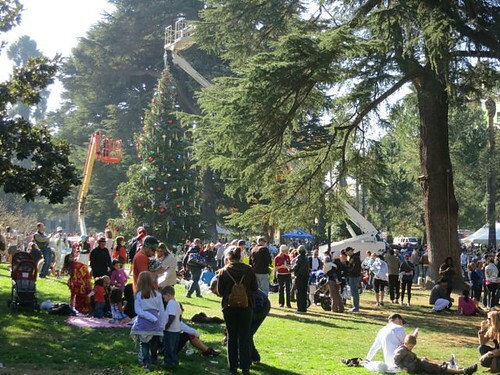 The Califonia International Marathon is a point to point, net downhill race. 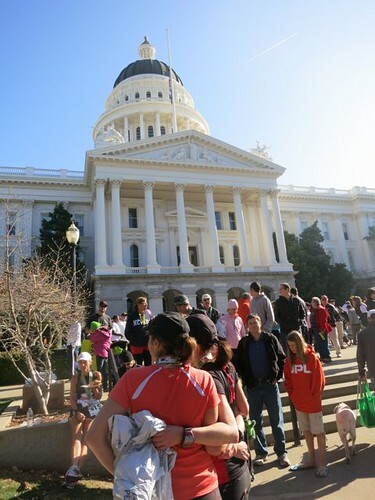 It starts at Folsom Dam, a 20-minute ride from Sacramento and ends at the finish line at California State Capitol in Sacramento. The course offers gentle rolling hills which allows for fast times and, subsequently, a high number of Boston qualifiers. 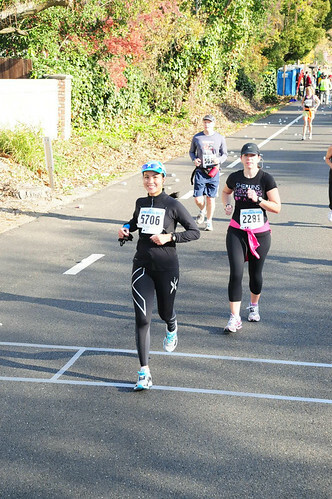 No wonder Runner’s World named it as one of the top 10 marathons to run your personal best. My hotel, which was booked with runners of all shapes and sizes, hired a bus that would conveniently take us to Folsom at 5:15 am. Race start was 7:00 am. When I stepped out of the bus, I thought I died and went to the North Pole; it was freaking cold. There was no wind (thank-you-Lord! 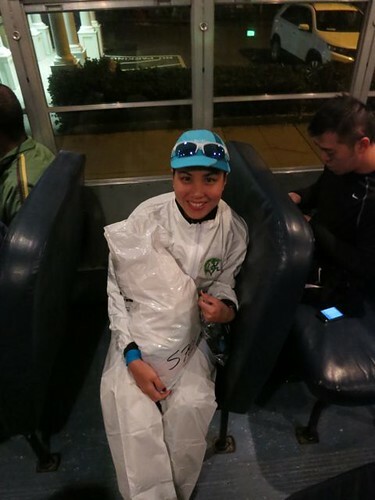 ), but with temperature at the low 30s, my Sheddable Shell (tear away wind breaker purchased at NYCM for $10) with a throwaway long sleeve top plus fleece jacket couldn’t keep me warm! 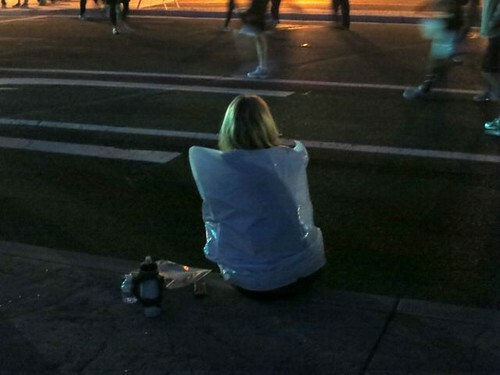 I was uncomfortable and I wanted to hide out in the bus until the gun was fired. But, I had to make a quick run for the portalet, check in my bag, and warm up. I waited in the cold for less than 15 minutes, then headed off to the assembly area for race start. 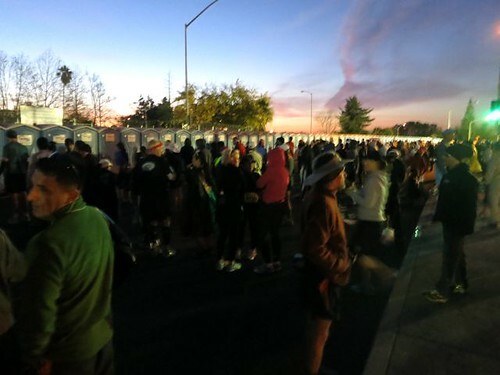 CIM is a relatively small race with 8,000 runners registered. (Post-race results show that only 5,300 showed up and finished). The start isn’t crowded at all and makes for a pleasant experience. 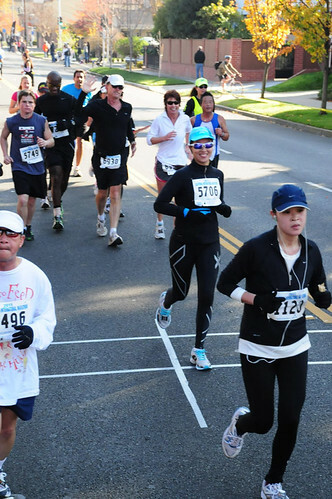 Most runners look experienced—slender, fit, and well-geared for the marathon. Pace teams stood out with their black flags and pace times. The leaders for each pace team were friendly and experienced and would later give practical tips along the run. For newbies targeting a specific time, this type of system would help give them maintain pace. But, in this race, most runners who joined probably hoped to get that extra nudge to achieve their Boston qualifying time. This was one serious crowd of fast runners. There was no major fanfare except for the Star Spangled Banner being sung. A few seconds after, we were off. We ran through the small and peaceful residential neighborhood of Folsom. The sun was out, the run was slowly increasing our body temperature, and the sounds of our footsteps hitting the pavement was almost tranquilizing. We ran an easy downhill then up a minor ascent which warmed us up even more. 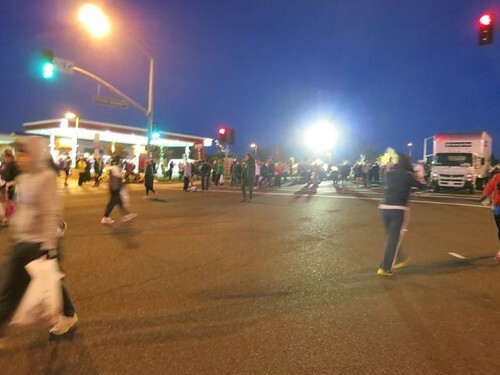 There were locals—some in their pajamas—who stepped out of their homes early that morning to give us high fives and cheer us on. The run was steady, but my legs still felt like lead due to the cool weather. My jacket and gloves were still on (I kept the gloves on until the race ended. Yes, that’s how cold it was!) yet I wasn’t breaking a sweat, literally. At one time, I bumped into good friend Lit and we agreed that our legs still weren’t fully warmed up, my nose was runny, and my lips were chapping. Offering him my chapsticks, I yelled: “Do you want my shlapsphtick?” Man, even my mouth was frozen! 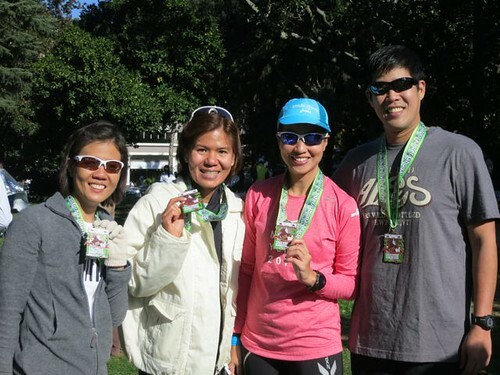 When they said CIM is a net downhill course, I feared it was downhill all the way which was no good for a marathon; it would tire our legs to be running the same way the entire time. Fortunately, this course offered gentle rolling hills. There were slight ascents, none harder than our very own Buendia Flyover killer, and the descents were gentle and easy on the knees. The roads were traffic-free, secure, and wide for most of the way. Race organizers did a good job in setting up this race. Truly the best course I have ever run for a marathon. How many times have you heard runners say: “Running is a metaphor for life”? 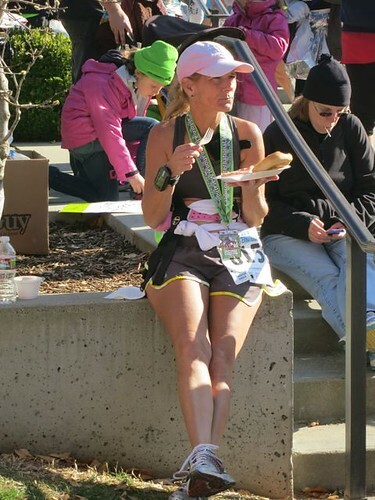 Well, marathons are much like life too. As you go along, you learn from your mistakes and successes, pick up a thing or two from those who know better, practice, practice, practice, and, when judgement day comes, you hope to be the better, stronger person you are shaped by your past. 1. RUN CONSERVATIVE IN THE FIRST HALF. I’ve heard and read this a hundred times before, but being the bullheaded person that I am, I always failed to practice it. After the big mistake at NYCM last month where lack of training due to my neuroma and an aggressive first half left me drained by Km 21, Lit reminded me to apply this principle again. A day before the race, I promised him I’d try thinking that I had nothing left to lose. I ran a conservative 6:20/km during the first Km 21 and found myself reaching Km 32 feeling great. 2. USE YOUR CORE. 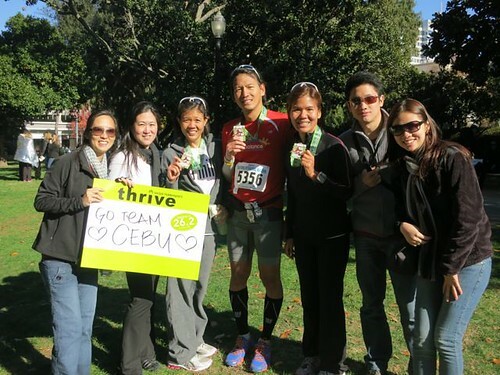 The day before I left for San Francisco, I ran with Ironman 70.3 2011 Champ and current TBR Magazine cover, Arland Macasieb. He gave me several tips on the Newton technique of running (I’ll post it here within the week) but what stood out was his advise to use my core, not the arms, to push forward. I practiced this during the race and felt like I could go on and on. Much of CIM is run at Fair Oaks Boulevard at Folsom. I knew we entered Sacramento when the street names became letters and numbers. I spotted the street name: 53rd Street and wanted to delete it from memory. You see, during the talk at the expo, we were forewarned that we should avoid looking at the street names during the last few kilometers. The race would end at 8th Street and counting down street numbers would only scare us about the distance. Well, it sure rattled me. 53rd street to 8th street. Woah boy, we had a long way to go. Fortunately, this portion was all flat. And, again, the autumn trees did nothing but inspire me to plod on forward. I focused on taking one strong step at a time. Before I knew it, I was at 20th street, then 15th, and closing in on 8th. 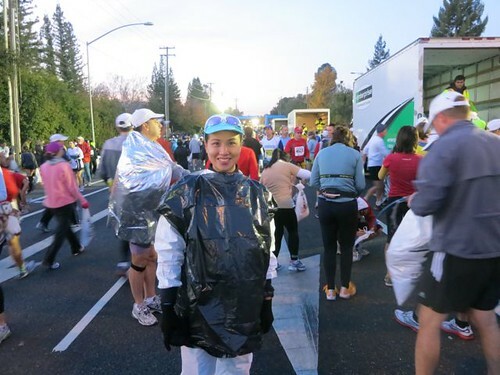 Among all 7 marathons I’ve run, this was the first and only marathon that I felt strong until the end. For the first time, I had absolutely no long walking breaks; I actually ran all the way until the end! I finished at 4:41, my second best marathon time after my Condura 2010 PR of 4:24. This was a whopping 40 minute improvement from my NYC Marathon finish exactly a month ago. With so little training due to my neuroma, I wonder about the possibilities of improved performance now that I’m fully recovered. I crossed that finish alone overwhelmed with joy and beaming with pride. I wore that medal around my neck and met Pinoy friends for a wonderful picnic of free bagels, cookies, and bananas by the Capitol. A perfect way to end a perfect race. Remember I said I wouldn’t run a marathon twice except for NYC Marathon which I finished in 2010 and 2011? Okay, I take it back. 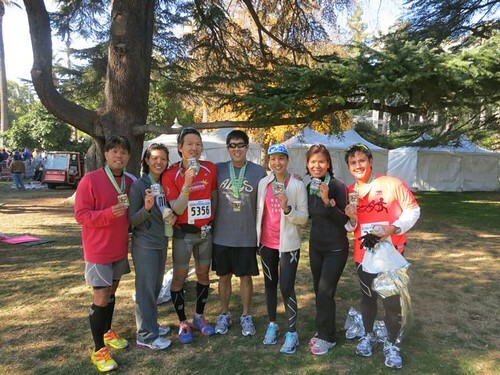 I would love to run CIM again…and again…and again. 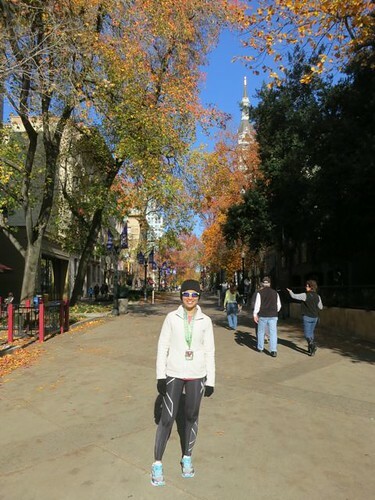 You really should give the Marine Corps Marathon a try! It’s a beautiful route, all the volunteers are uniformed US Marines (and they even put the medal around your neck), and seeing all the DC monuments can’t be beat! Congratulations! I’m glad you like CIM. This was my second CIM. I like the elevation, course and the weather. Thanks Steve! I agree with you on the first two but I was hoping for the weather to be a little bit warmer. Still, I was happy. Wish I can run it a second time like you. congrats jaymie! u inspire me so much! Congratulations and what a good time you did. It’s a merry christmas! thanks Alex! Merry Christmas to you and Elaine! Congrats Jaymie on a great run. Keep on writing about your international running adventures. It will inspire us more. Sounds like an awesome course! Congrats on the great run! thanks Jenny! 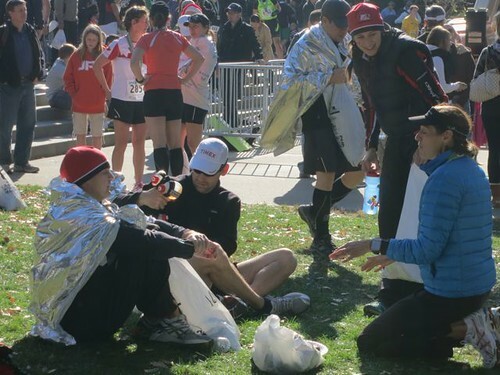 I’ll come out with a post on tips for running a marathon in a cold country. Tokyo is a dream for me! You are so lucky!